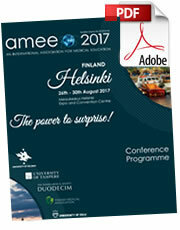 Can't make it to Helsinki for AMEE 2017? * Click here to register and sign-up for the webcast. Good news. Not everyone can find the funds, or the time, to attend AMEE 2017 so we will be livestreaming the conference live from Helsinki. Watch it online from your desk, your tablet or phone. 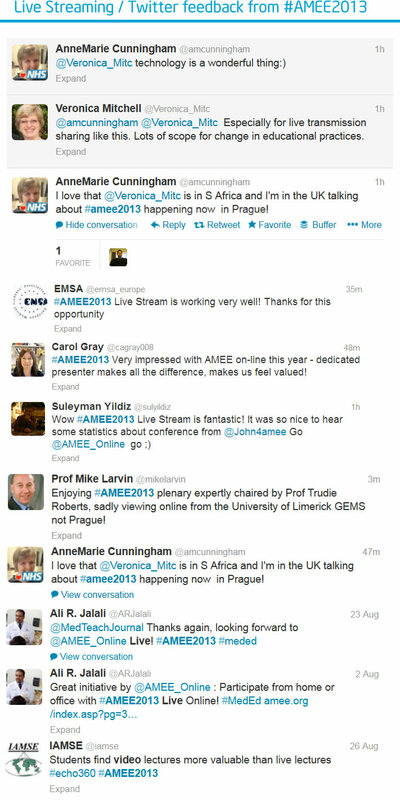 We’ll live stream videos of the keynotes, speaker sessions and interviews on all four days via "AMEE Live" . We're live from the 27 - 30 August 2017. Watch the opening ceremony, all five plenary sessions and eleven symposia sessions live as they happen, or catch up afterwards if the timing doesn’t suit you. Hear live interviews from our expert panel of speakers and delegates. Take part in the discussions and ask questions to the speakers from your own home or from your institution as an individual or with a group of colleagues. The AMEE annual conference is now established as the key meeting for all involved in medical and healthcare professions education including teachers, educationists, researchers, administrators and students. Over 3500+ delegates will be attending #AMEE2017 in person. If you can't be there, then join us 'virtually'. Over the four days we will be streaming all the five main plenary sessions and eleven symposia sessions - live and on-demand. That's >43 of the world's best medical learning experts delivering over 18+ hours of video content. It's the next best thing to being there. Plus don't forget you can join in the debate, and ask questions on twitter using hashtag #AMEE2017 throughout conference - see details below. When you register to join 'AMEE Live', a unique ID and password will grant you access to the live webcast and all the session recordings. You simply login, select the session you’d like to watch and click play. You’ll see the same sessions that conference delegates experience. You can also download a PDF of each slide deck for further study. Session recordings will be uploaded at the end of each day and you will be able to access videos all year round on the AMEE Live website. Watch anywhere, at anytime, on any device. Can I watch on my mobile / Iphone / Ipad / Tablet? Yes the stream is desktop and mobile friendly. You'll be able to watch all footage live and on-demand across IOS, android and desktop PC's / Macs.